Pahlish “Patisserie de Pahlish” collection swatches and review! Hi there everyone! I have a decent sized post for you all today! Pahlish is releasing a gorgeous collection this Friday inspired by macarons and marshmallows. There’s such a great variety of colors in this collection that I’m sure you’ll find a favorite. Let’s dive on in to the swatches! First up we have “Griotte Amande,” which is described as a soft marsala cream. This polish was surprisingly opaque, but I used two coats for the photos below. Next up we have “Menthe Glaciale,” which is described as a rich glacier blue cream. I just love this blue! I used two easy coats. Next up we have “Petale de Rose,” which is described as a soft orchid pink cream. This was one of my favorite shades from the collection! I used two coats for my photos. Next is “Cassis Violette,” which is described as a violet-greige cream. Another one of my favorites for sure! I used two coats below. Next up we have “Pistasche,” which is described as a warm pistachio cream. I used two easy coats for this pretty spring green! Also releasing this Friday is two beautiful toppers that were inspired by marshmallows. These both work awesome with the “Patisserie de Pahlish” collection! 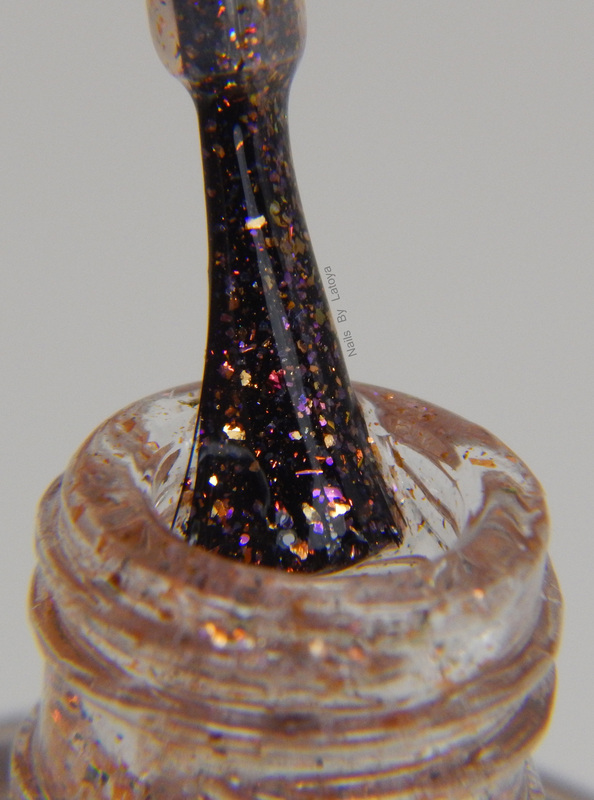 The first one is called “Guimauve a la Framboise,” and this topper is described as having a mix of copper flakes with rosy glassfleck shimmer, and red ultrachrome flakes. The next topper is called “Guimauve a la Violette,” and it is described as a topper with a mix of silver and purple flakes with purple glassfleck shimmer, and purple ultrachrome flakes. Such a stunning topper! I hope you all enjoyed this post! These release this Friday at 7 P.M. CST. The full Patisserie de Pahlish collection will retail for $55 and individual polishes will be $11 a piece. The toppers will be $11 per bottle in the shop. I’d also like to say thank you to all of my new followers here and on Facebook! Once I hit 1000 likes on Facebook I’m going to have a giveaway. This entry was posted in Beauty, Nail polish Swatches and tagged indie. review, makeup, nails. Bookmark the permalink. ← Pahlish April Duo: The Delicate sound of Thunder swatches and Review!